From July 17 until August 2, 1945, a conference was held by the victorious powers who had defeated Germany. 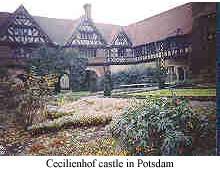 Truman, Churchill and Stalin met at Cecilienhof castle in Potsdam near Berlin. 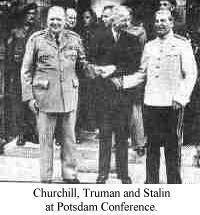 The Potsdam agreement, to a far greater extent than that of Yalta, determined the shape of post war Europe. Among other important decisions, they reached an agreement on how to divide the defeated country between them: Not only was Germany parted in four zones ( French as well ), but the capital of the Third Reich was divided into four sectors, with the Russians getting almost half of the city, which became East Berlin, while the Western Allies shared the other half into three sectors, which became West Berlin. During the following years Bonn became the capital of West Germany, and on Oct.6, 1949 the Russian occupied zone became the country of East Germany, a country with a truly grand new name, calling themselves The German Democratic Republic, with East Berlin its capital. We could travel freely from West to East, which we often did, as almost everyone had families in the Eastern part of Germany and East Berlin. 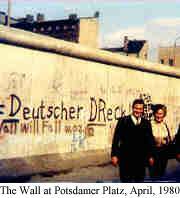 Technically West Berlin belonged to West Germany, although geographically it was located in the center of East Germany. Anyone wanting to travel from West Berlin to West Germany by road or rail, had to pass through East German check points. In the early post war years these check points were under the control of Russian military personnel. Over the years two, almost predictable, things happened: West Berlin became a pulsating metropolis, modeled after larger American cities, while East Berlin with its strong ties to the Soviet Union became something of a Mini-Moscow. The Soviet Union struggled against tremendous odds to get back on its feet, after the terrible destruction of their country and the unbelievable loss of millions of men in the war. Under the Soviet system, the economic recovery was very slow and in some places hardly at all. In most city stores the shelves remained half empty and the goods available were of an inferior quality, unless one had enough currency to buy goods in special stores near the western border, or in the west period. For the most part, these goods remained unattainable for the ordinary citizens. 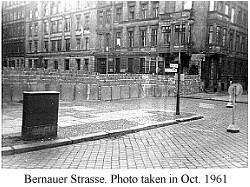 It was a similar situation in East Germany, but it was most visible in East Berlin, where I had visited numerous times. On the morning of June 17, 1953, we awoke to radio news that workers in East berlin were rioting in the streets. It soon escalated and just before noon they were marching through the Brandenburg Gate with the intension to consolidate with workers in West Berlin. All came to a swift end, Russian tanks drew up and fired into the unarmed crowd. 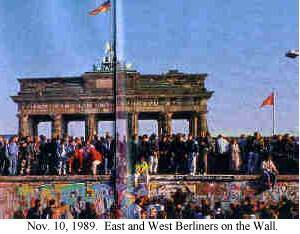 They even fired through the Brandenburg Gate into West Berlin, where a large group of people from East and West were gathering to support the demonstrators. Ambulances from several hospitals were rushed to the vicinity and I was in one of them. Eight years after the last battle I again saw people lying in the streets, shot to pieces. The Americans made a show of force with tanks and troops, but did not intervene. British troops were there as well, I could see them camped out in the wooded areas on both sides of the street leading to the Brandenburg Gate, called the Tiergarten. I was not only impressed, but also very grateful, with the restrain the Americans showed on this day. It was the height of the Cold War, and it would not have taken much to embroil all of us in Berlin and the rest of the world into a terrible confrontation ( It was on this day that I decided to leave my country, because I could see that relations between the occupying nations would not improve in the near future. We were caught directly between them. We were sitting on the proverbial powder keg, and it was time to leave for somewhere, anywhere, as long as there was peace ). It is naturally human, wanting to live like the relatives and friends in the west, and in the late 1950’s approx. 8000 to 10000 people left East Germany, East Berlin in particular, each day for the west. East Germany could not afford to lose so much man power. Many were specialized trades men as well as members of the professions. The government of East Germany found itself utterly helpless to stop their people from leaving in droves. But someone over there had an idea how to stop the people: To build a wall, so high and booby trapped that no one would attempt to climb over it and anyone who dared to get through, would be shot. So, this infamous symbol of the cold war was erected on August 13, 1961. It surprised Berliners on both sides. Many East Berliners were working in the west and became separated that night from their families for years. The Wall did not only divide Berlin right through the center and all around the outer rim of the city, it also was built on the border between West Germany and East Germany, reaching from the Baltic Sea southward through the center of Germany to the vicinity of Hildburghausen, where it turned east towards the border of Czechoslovakia. People were numb at first, but when they saw whole blocks of houses torn down and replaced with mined death strips and guard towers, they knew that they were in for the long haul. It was not the first time that Germans came face to face with hardship and adversity, so, they did the only thing they coud do: They did their work and tried to go on with their lives. It became easier with the passing of time. A new generation was growing up, who had known nothing else, and soon a certain amount of pride in their country was noticable. The government of East Germany poured millions into sports, just like big brother Russia. Training of the athletes began at an early age, was strict and vigorous, and soon we could all see the results at the Olympic Games, summer and winter: Russia and East Germany were the two counties whose athletes took home the medals. But with all their show of pride, and even their boasting to me about new stores at the Alexander Platz, etc. on my visits to relatives through Checkpoint Charlie with my Canadian passport, I could sense a certain pretense. Something felt superficial. The years passed, but somehow the undercurrent of discontent was never too far below the surface. Once in a while some one tried to get through to the west. Only a few made it, and in all 70 people lost their lives trying to get to the other side, just to live in freedom. In all fairness it must be said that the people of East Germany tried to make the best of it for over a quarter of the century. In the mid 1980’s we saw a change in east-west relations. The freeze of the cold war started to thaw. A change occured in the Soviet Union; Mikhail Gorbachev, an educated, intelligent and seemingly caring man, appeared on the world stage, voicing his concerns about the need of reconstruction of his own country and the world in general. In 1987 he published a book called "PERESTROIKA", which explains in detail his thinking. The new leader addresses the world at large in his book: ”It is not easy to change the approaches on which East-West relations have been built for fifty years. But the new is knocking on every door and window. It was indeed. In May 1989, West German Television broadcasted the news that Hungary was opening its borders to Austria. As airwaves know no boundaries, the people of East Germany saw it too. By the hundreds they applied for travel visas, but the newly opened border between Hungary and Austria remained off limits to them. But by September 1989 so many people from East Germany had arrived in Hungary, that something had to be done. For a few hours, they allowed East Germans to cross into Austria, a total of 4,500, as a good-will gesture. The rest took refuge on the gounds of the West German Embassy in Prague. Most slept in tents. Rain and mud did not deter them; they were determined to leave all they had known behind. On October 6, 1989, East Germany celebrated their 40th anniversary of statehood. In the morning a military parade marched through the city, with East German dignitaries looking on. The guests of honour were there as well: Mikhail Gorbachev and his wife Raisa. In the afternoon all was eerily quiet in the streets of East Berlin. 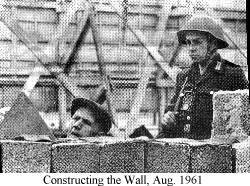 Not many ordinary citizens could be seen, but a lot of agents of the Secret Service State Police (STASI) were milling around with walkie-talkies and binoculars, making East Berlin looking like a Hollywood spy thriller. That evening thousands of youg people were called upon to take part in a grand torch-light parade. "We have worked our fingers to the bone for this country, and we are not standing by to see it all fall into ruins. The truth has come to light. A nation that can not keep their young at home, has no future." 1.) The right to free access of information. 2.) We demand the right to open political discussions. 3.) We demand the freedom of thoughts and creativity. 4.) We demand the right to maintain a plural ideology. 5.) We demand the right to dissent. 6.) We demand the right to travel freely. 7.) We demand the right to exert influence over government authority. 8.) We demand the right to re-examine our beliefs. 9.) We, the people, demand the right to voice an opinion in the affairs of state." The government of East Germany felt compelled to give in. A train left Prague for the west, filled with East Germans. On November 9, 1989, East German televison announced new travel regulations. East German citizens could now travel without restriction to the west. It took the world by surprise: THE WALL IS OPEN. A tidal wave of thousands are making their way through the open checkpoints. West Berliners were there in throngs to welcome them. Disbelief turned into unequaled euphoria. West Germany announced that every citizen from the East would receive welcome money in the amount of DM 100.-( The East German mark had very little buying power. ) One hundred west mark equaled about 55 Dollars. Not much, but for people, for whom bananas and oranges were a luxury, it was a great deal. Long lines of people could be seen at West Berlin banks. Elated beyond comprehension nobody felt the cold during the night of Nov. 9/10. Around 4 AM they were still celebrating in the streets of West Berlin. They were still crowding into shops, mostly to look around or buy a few things to take back home. No one who was there will ever forget it. On November 10 and November 11 the flow from East to West was endless. The main artery of West Berlin, the Kurfuerstendamm had to be closed to traffic. Tom Brokaw was reporting for American television from the Brandenburg Gate, the old symbol of the city. For 28 long years it has been part of the wall. It was still closed, but dozens of people had climbed on the wall in front of the Gate. In the evening of November 11 the first concrete slab was removed from the wall to the cheering of thousands. On November 12 the Wall was opened at Potsdamer Platz, which once was one of the busiest crossroads in Western Europe. Camera crews from around the globe were waiting at the Brandenburg Gate. When will it be opened? Finally, international journalists got the word: The Brandenburg Gate will be open by Christmas! The government in East Berlin took its time. On December 22, the people of Berlin once again could claim the Brandenburg Gate as their own! The happiest people were the ones re-united with their families after so many years. The people of Berlin knew who to thank. "Gorbi, Gorbi!" they shouted. Gorbatschew was not only a name of a Russian vodka they saw advertised on West Berlins busses! On the occasion of the opening of Potsdamer Platz, the Philharmonic orchestra in West Berlin held a benefit concert for the poeple of the East. They played Beethoven’s Seventh Symphony opus 92. Leonard Bernstein, speaking in fluent German on the tape made for the occasion of the fall of the Berlin wall, was overcome with emotion. No one in our lifetime had expected this to happen. At a Christmas concert, Berlin received a special gift: Leonard Bernstein conducted the Philharmonic orchestra: They played Beethoven’s 9th Symphony: Ode to Joy. To me it is the most moving of all the symphonies, and it was most fitting for this occasion of unequaled joy. Friedrich von Schiller write the words in 1785 and Beethoven put it to music in 1799. In German it is ”Freude schoener Goetterfunken.”. For anyone who wishes to obtain the lyrics, click here. This monstrous barrier, which had caused so much grief and pain for so many, has become nothing but a sad memory. But the most amazing wonder of it all: It happened without violence, it happened because people wanted to live in peace and freedom. If you enjoyed this story, visit for more. Click HERE to send Ursula e-mail.